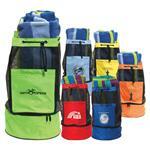 Custom Cooler Duffel Bag with your promotional logo - a great picnic or travel item. 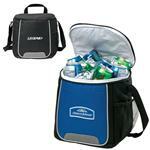 Fully insulated, waterproof main compartment holds 12 cans plus ice. Cooler lining is removable for additional storage space. Two large zippered front pockets for extra storage. Two zippered end mesh pockets. Padded handle and adjustable shoulder strap. Comes in Black, Burgundy, Blue, Purple, Red, Orange, Pink, Royal Blue, and Yellow. 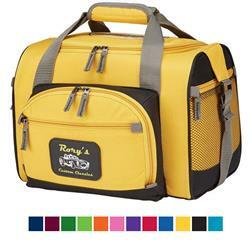 We love this cooler bag! Available Colors: Comes in Black, Burgundy, Blue, Green, Lime Green, Purple, Red, Orange, Pink, Royal Blue, Turquoise and Yellow. Typical Imprint Area(s): Screen - 8"L x 5"H. Deboss available. 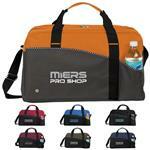 600 Denier Polyester, 12 Pack Cooler Bag and Duffel Bag. Removable liner.